This book introduces a study of ethics and values to develop a deeper understanding of markets, business, and economic life. Its distinctive feature is its thorough integration across personal and institutional perspectives; across applied ethics and political philosophy; and across philosophy, business, and economics. Part 1 studies markets, property rights, and law, and introduces normative theories with many applications. Part 2 examines the purpose of corporations and their responsibilities. Parts 3 and 4 analyze business and economic life through the ethics and values of welfare and efficiency, liberty, rights, equality, desert, personal character, community, and the common good. This second edition maintains the strengths of the first edition—short, digestible chapters and engaging writing that explains challenging ideas clearly. The material is user-friendly, with an emphasis on a strong theoretical core. Easily adaptable to the instructor’s teaching, the chapters are separable and can be shaped to the interests of the instructor with suggested course outlines and flexible application to case studies. This text is designed both for coursework in business ethics, as well as interdisciplinary programs in philosophy, politics, economics, and law. includes a new ending chapter on the value of an ethical life. "An outstanding work! This distinctive and illuminating textbook provides students with a thorough understanding of markets, property rights, and the role and responsibilities of corporations. It shows how the ethics of our business and economic lives are impacted by the values of efficiency and welfare, justice and liberty, desert and rights, as well as community and personal relationships. Steven Scalet does an excellent job of bringing alive sophisticated moral, political, and economic issues in an accessible, student-friendly text, full of pertinent examples and helpful illustrations." 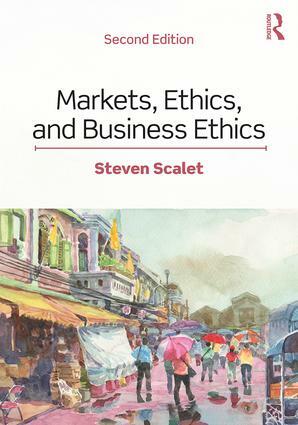 "Steven Scalet’s Markets, Ethics, and Business Ethics, 2nd Edition is an impressive text. Integrating several areas of study (namely, ethics, political philosophy, and economics), its clear prose makes many important but often puzzling ideas from within those areas easily accessible to newcomers. Fair-minded and comprehensive, Markets, Ethics, and Business Ethics, 2nd Edition is an invaluable guide for students who seek moral understanding of the modern economy." "Scalet’s Markets, Ethics, and Business Ethics, 2nd Edition strikes the right balance in all the right places. The coverage and approach of the book put key concepts in moral theory to work so that students are prepared for ethical problems in business contexts and social and economic life more generally. Perhaps its greatest strength is its integrative nature—the theoretical and practical connections it makes throughout and the connections its asks students to make, and build upon, in their own thinking and in their own lives." Steven Scalet is Professor of Philosophy at the University of Baltimore (UB). Prior to UB, he was the Director of the Program in Philosophy, Politics, and Law at Binghamton University (SUNY), where he received the Chancellor’s Award for Excellence in Teaching. Scalet received his PhD in Philosophy and MA in Economics from the University of Arizona. Scalet is the editor of Morality and Moral Controversies: Readings in Moral, Social, and Political Philosophy, 10th Edition (Routledge, 2019).